Broad bean and pea plants were sprayed with various Garuda biodynamic sprays in a trial set up to observe the effects of the sprays on plant growth and development. The different treatments had measurable effects on plant growth, rate of growth, form of leaves and roots, flower and seed development. The Etherics 1000 and the Pest Protection and Lime treatments resulted in vigorous growth, large, rounded leaves, long stems, shallow, branching roots with good nodule development and late, but prolific flowering and bean set and long pods. After spraying some of the Etherics 1000 treated plants with 4 applications of 501 spray they developed longer, more pointed, bluer leaves, spiraling stem growth and longer roots, earlier and more prolific flowering, bean and pea production. 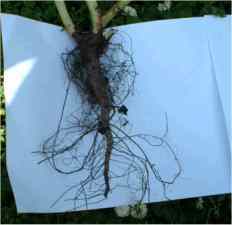 Plants initially treated with rooting compound had smaller, more compact stems and leaves and thicker, longer roots with little secondary root development. After some of these plants were sprayed 4 times with Warmth spray their leaves became rounder and more horizontal. Flowering and bean set were earlier and fewer but larger beans and peas were produced. Later treatment of some plants with the Flowering spray resulted in more shoot growth and earlier and large bean and pea production. Possibilities for application of the sprays to direct plant growth for various purposes, in a similar way to use of plant hormone sprays, are discussed. Larger, replicated trials on several different soils and locations over several years of varying weather conditions are needed to look for statistically significant effects of the sprays under the various conditions. Garuda Biodynamics produces homoeopathic sprays for use by organic farmers and growers to boost and regulate plant growth and reduce pest and disease incidence. These sprays are based on the biodynamic preparations, which are made and applied by biodynamic farmers and growers as part of the biodynamic method recommended by Rudolf Steiner in 1924. Effects of homoeopathic dilutions of the preparations were first reported by Kolisko (1978). Used in the trial to see its effect. Two sprays in this trial are quite unique: The Flowering spray to hasten and enhance flowering of fruit trees, vines and flowering vegetables; and the Rooting spray to enhance root growth and development. These sprays can be applied at appropriate times to the plant as required. The range of Garuda sprays can be applied to fruit, grape, grain and vegetable crops and pastures to promote plant health and specific growth processes and to control pests and diseases. The Garuda sprays have particular potential for organic growers for whom certification standards prevent the use of chemical growth regulators and pesticides. One such product that cannot be used by organic kiwifruit growers is hydrogen cyanamide (HiCane), used to promote bud-burst and flowering and increase kiwifruit yield. Application of particular Garuda sprays at appropriate times has been found to have similar effects to those from Hi-Cane. Andola Orchard Management – a crop monitioring company has written of the orchard where the Flowering Spray has been applied for three seasons “You might like to know that Geoff Gibbs orchard had one of the highest bud burst rates (42.3%) for organic orchards. His orchard was the only one to exceed previous years flowers per shoot, whereas every other orchard where we had previous years data were at least half a flower down ( per shoot ). If these sprays can be shown to be effective in increasing kiwifruit yield, they could make a significant difference to the economics of organic kiwifruit production, and also provide a benign alternative for conventional growers who suffer health problems from use of Hi-Cane. 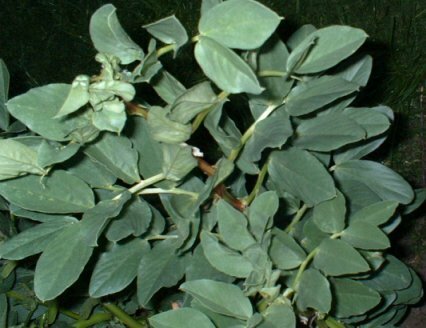 The effects of the Garuda flowering, Etherics, Rooting, Warmth and 501 sprays on growth of broad bean and pea plants were investigated in a trial in 2002. Considerable differences in growth, form and yield were observed. A trial was set up to observe and measure the effects of various Garuda sprays on plant physiological development, yield and quality on broad beans and peas. The trial was set up in a newly cultivated paddock on Te Puke volcanic sandy loam soil in the Bay of Plenty. The paddock had been farmed organically for at least 13 years, and grazed by dairy cows. All the sprays except the Warmth and 501 sprays were applied once at the beginning of the trial and again 13 weeks later. The Warmth and 501 sprays were applied 4 times each as the plants developed. The Flowering spray was applied just after flowering started to 2 bean and pea plants in each treatment. At five weeks from sowing the beans and peas treated with rooting compound showed the greatest root and shoot growth, but by eight weeks the beans in the Etherics 1000 and Pest Protection treatments had most vitality, secondary root development and biggest, roundest and darkest green leaves. The plants treated with Rooting spray and “all” sprays were more compact and upright with smaller but healthy, bluer colour leaves. The plants later treated with Warmth spray had yellowy green rather than blue green leaves and the leaves were more horizontal. The plants treated with 501 had longer, more pointed, blue green leaves. Observation of the whole plants at harvest times showed effects of the various sprays on internode length, size and shape of leaves. The plants treated with 501 also showed a more spiraling stem growth in contrast to the straighter stems of the control treatment. At 3 weeks from sowing, the roots from the Etherics 1000 and control treatment bean plants were most developed in length and secondary root development. Those in the Pest Protection and Lime treatment were shortest. 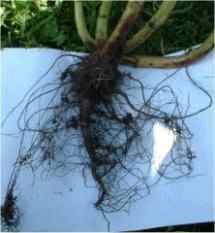 At the end of the trial, after harvest, the Pest Protection and Lime treated plants still had shallow roots, but with a lot of branching, and numerous, healthy looking nodules and the soil adhering closely to the roots. The roots of control plants were quite similar. 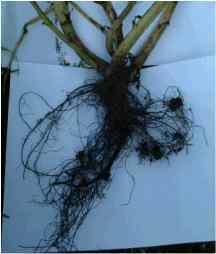 In contrast, the plants treated with rooting compound had thick, long primary roots with much less branching or nodule development and little soil adhering to the roots. The plants treated with Etherics 1000 and then 501 also had thick, long primary roots but they also had considerable secondary branching roots as well. Beans treated with Etherics 1000 and Pest Protection produced the longest bean stems, with more nodes and longer internodes. Those treated with Warmth spray produced more bean pods. Those treated with 501 produced the greatest number of bean pods, starting to set pods at an earlier stage. However, by 19.5 weeks from planting those treated with rooting compound and Warmth spray had produced the highest number of harvestable bean pods. Total yields were not measured, but it appeared that those treated with Pest Protection and Flowering spray and those with Etherics 1000 and 501 would have had highest yields as they continued yielding longest. All the bean and pea plants kept very healthy, free from pests and disease, with strong, upright stems, in spite of strong winds and dry conditions for most of the trial period. The measurements of growth rates, yields etc in this trial provide an indication of observable differences between effects of the various sprays but cannot be used to predict quantified results from each spray under a range of different conditions. The results were from application of the sprays to a few plants on this particular sandy, volcanic loam soil, under the particular mainly dry, windy weather conditions experienced during the trial period. Larger, replicated trials on several different soils and locations over several years of varying weather conditions are needed to look for statistically significant effects of the sprays under the various conditions. How the biodynamic sprays affect plant physiological processes has not been much investigated. Fritz et al (1997) investigated the effects of the biodynamic preparation 501 on french bean plants and concluded that the spray had a gibberellin- like effect. The various effects observed in this trial could be similar to those that result from spraying plant hormones. Some New Zealand growers are already using the sprays to direct plant growth for particular purposes or to assist the plant to grow under particular conditions. The results observed in this trial indicate how this could be done. For example, the Etherics sprays provided fast, vigorous growth with shallow roots. The rooting and 501 sprays encouraged deeper root development, which would be useful for dry conditions. The Warmth spray assisted the plant to grow in cold weather – as broad beans and peas generally grow well in cool conditions, greater effects of the Warmth spray might be expected in plants that need warmer temperatures. The combination of sprays used affected flowering date and number of flowers and thus timing and size of harvest. The main use of biodynamic preparations is to balance the various growth processes to produce more healthy plants and the Garuda biodynamic sprays are also mainly used for that purpose. There were clearly observable effects from spraying with the various Garuda biodynamic sprays, on plant growth, rate of growth, form, leaf, root, flower and bean development. These effects related generally to the effects that are indicated by the spray names. Fritz, J., P. Meyer-Glitza, et al. 1997.”Basic studies on the plant treatment preparation horn silica. [German].” Schriftenreihe – Institut fur Organischen Landbau.. 4: 231-237. Kolisko E. and L. 1978. Agriculture of Tomorrow. Kolisko Aarchive Publications, England.